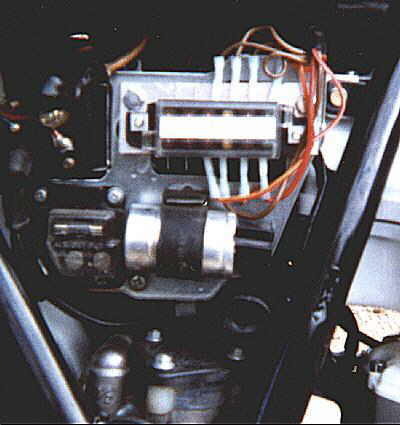 The XS11's fuse block is a notoriously weak point of an otherwise fine motorcycle. So I decided to replace my fuse block. It looks and works great and fits in the same place as the original fuse block while giving you two additional fuse connections. The place to buy an Auxiliary Fuse Block is J.C. Whitney. (Part No. 03dh7115w). 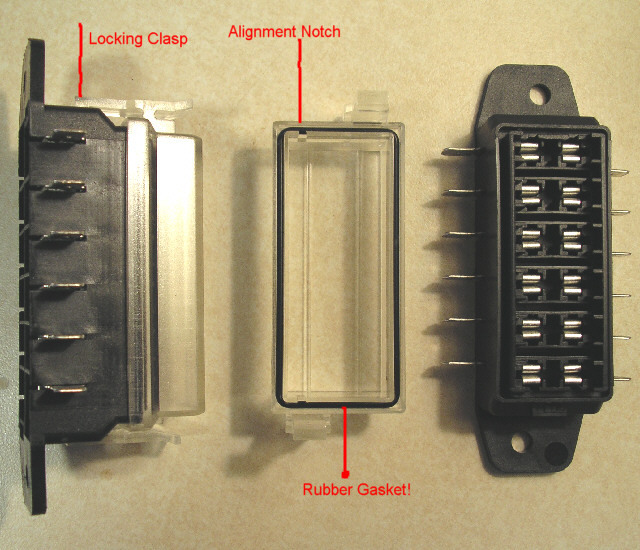 It costs about $24.95 + shipping and uses spade type automotive fuses. Don't get any of the other fuse blocks from JCW because they won't work for our application. This is the only one they sell which has independent in and out leads. All the others have one input and multiple outputs. Great if you're adding a ton of accessories but inappropriate as a replacement for our fuse block. You don't have to know anything about electronics but you do have to work methodically. Don't remove any wires until you're ready to do the whole job. Even then, only work with one wire at a time so you don't connect things incorrectly. 2 small nuts, washers and bolts to attach fuse block to backing plate. 2 rubber grommets (as standoffs to fill gap between backing plate and frame. Unscrew the bolts which hold the plastic fuse block in place. Leave all the wires in place in the old fuse block at this time. Take the aluminum backing plate and trace the holes from the original fuse block onto the plate. Now trace the holes from the new fuse block onto the aluminum backing plate. Make sure the holes aren't too close to allow clearance for the mounting bolts. Drill holes in backing plate. Using a new razor blade and a delicate touch, cut back the wrapping on the wiring harness about 2 inches. This will give you more of the wires to work with. Take a roll of masking tape and make little marker flags for each wire coming into the old fuse box. Make sure the flags are about 3/4 inch above the connector. Label each pair of wires (Ignition, Headlight, etc.) so that you don't screw up the connections. Carefully remove the wires from the old fuse box. I used a small screwdriver to release the old fuse holders from the plastic box. With wire cutters, cut off the old fuse holders as close to the crimped connection as possible. Strip off about 1/4 inch of the insulation and crimp on one of the female spade connectors for each wire. (I know that Doug likes soldering these connections and that's fine but it's kinda hard to work with wires which are so close to the bike.) Using Vice-Grips to crimp these connectors has worked much better for me than the special crimp tools they sell for that job. Don't use the sheet metal screws that come with the new fuse block. Instead, use appropriate sized bolts to attach it to the backing plate. I chose to have the heads of the bolts on the back side of the backing plate to make sure the extra length of the bolt doesn't dig into the frame plate. Use the rubber grommets on the bolts on the back side of the bolts which attach the backing plate to the frame plate to make sure that the assembly mounts securely. Attach the wires to the connectors. I found that having the wires come around the right side of the fuse block (instead of having the wires come around the left side in the stock fuse block) puts less stress on the wires. I did have to change the order of the fuses and wires because one pair of wires seemed a little short to provide a stress free connection. I used a drawing program to create a label to attach inside the clear plastic cover. I glued it in by "painting" the front side of the label with white glue and putting it in the inside of the plastic cover. (don't worry that you can't read it right now - when it dries it will be clear.) make sure you glue it in right side up as the cover will only go on one way. Since this was posted, we've found a much better priced location for acquiring these fuse blocks. They are quality devices, from DelCity. I order enough quantities to meet the minimum order limit, and then supply them for just a few dollars more than their cost, just to cover shipping to me, PayPal fees, postage, and shipping supplies...bubble envelopes!! I am not making any profit! SO...you can send $9.00 to my PayPal account ...... topcatgr(at)hotmail.com, just replace the (at) with @ of course! **Just copy/paste it into the PayPal Send Money To box** include your full name/address and XS11 handle in your paypal message so I can keep your orders straight, and I'll get it to you ASAP!! Apologies for the price hike, Del City just raised their prices a whole $1.00. ALSO the USPS modified their rate structure 5/07, packages that are over 1/4" thick are charged more, so instead of just $0.75, it now costs $1.47 to send one! Here's the tech thread discussing this . As most of you know, I "happily" provide/resell the fuseblocks I get from DelCity for members here, since they would otherwise have to buy 5 of them to get the minimum $25 order amount. It was recently suggested that it would be possibly beneficial to those getting the fuseblocks that I also provide the 90 degree insulated 1/4" terminals that would fit them as well!! I looked into it, and DelCity does offer a 90 degree "Flag style" 0.250" terminal connector in the 14-16 ga wire range. I am offering a set of 12 for about a $1.00 extra along with the $9.00 fuseblock price. Radio shack offers them but only in a 6 pack, and 3 are 14-16 ga and 3 are 22-24 ga, for $1.99 . 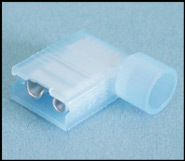 They also offer uninsulated 90 degree/flag style terminals in a 10 pack for same price, all 14-16 ga. SO....this is an OPTIONAL item, if you want just the fuseblock, okay. IF you want the connectors, just state so, and send the appropriate funds for either or both! Info Updated 08-30-2011...I keep these in stock, and will continue to provide them as long as I'm the Admin, etc.! This post will be editted IF/WHEN I decide to no longer sell them!